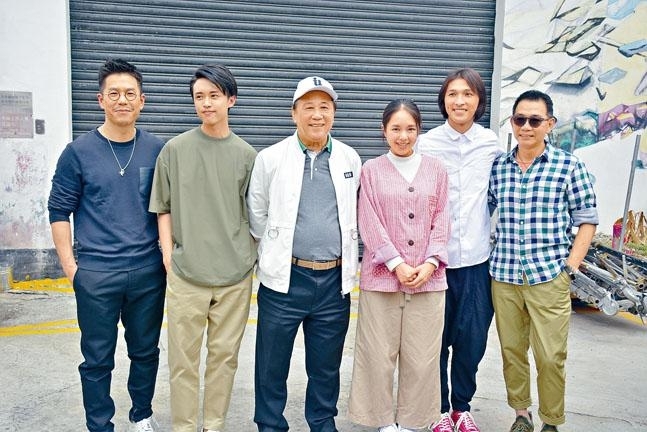 The film HELL BANK PRESENTS: RUNNING GHOST (MNG TUNG NGAN HUNG DUK YEUK FAN SUN JUNG BA JIN) yesterday shot a big scene at the Yuen Long Studio. Actors Wong Yau Nam, Cecilia So Lai Shan, Ben Yuen Fu Wa, Zeno Koo Ting Hin and boss Ha Yu participated. The scene also had 100 extras. Wong Yau Nam revealed that the film would be about a human ghost romance. In the studio a hell set was constructed. Yesterday a group of ghosts were in competition. In the film he would also have a series of stuns. Although he was sweating bullets, he has been in training so he was able to handle it. So Lai Shan this time would play a medium who by chance drew in Yau Nam. As they would help each other they would develop a human ghost romance. Because of that, they would have no intimate scene except a little "hand touching". Thus before the shoot she did not need to inform her boyfriend. Yuen Fu Wa with Koo Ting Hin only had one scene together. They both had to be on the wire for a stunt for the first time. Yuen Fu Wa joked that he was hung to fly 3 to 4 meters onto a tree, which was a lot of fun. Speaking of the upcoming Hong Kong Film Awards, Yuen Fu Wa has been nominated for Best Supporting Actor. He said that he had confidence but it did not mean that he would definitely win. "The competition is very strong, just Uncle Chi (Liu Kai Chi) alone is enough competition. I hope that everyone would win because everyone contributed a lot of hard work. Unfortunately the standard only permits one winner. I would just treat it normally!"